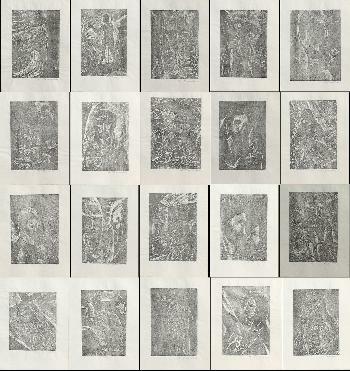 Cassette holding twenty b/w prints showing the life of Jesus Christ. Each print is signed in pencil and is in its original folder. The cassette is of black linen, lined with velvet paper. Size of the cassette is 41 x 33 x 3.5 cm., each print is 23.3 x 31.5 cm. Self-carved and self-printed, number 38 from an edition of 50, published in 1976. Fine impression and condition: photographs of each print are available - do not hesitate to ask for them to get a closer look.